Triggered by someone that bought the wrong issues of a Howard the Duck series due to Marvel's reboot shenanigans, retailer Mike Sterling talks about the tribulations of labeling comics that have multiple volumes. All i'll add is that as a back issue consumer, or just someone that wants to goddamn look something up on goddamn UHBMCC, the constant goddamn reboots are indeed a goddamn nuisance. Sterling has talked about this before, and i noted at that point that Marvel doesn't really care about problems that retailers have selling back issues. I was hoping that now that Marvel is basically in the business of selling back-issues (digitally) they would start to care more, but that's probably a pipe dream (and it would be too late to help me anyway). This is a make-ahead type recipe. The pie needs to sit in the fridge overnight to set properly. 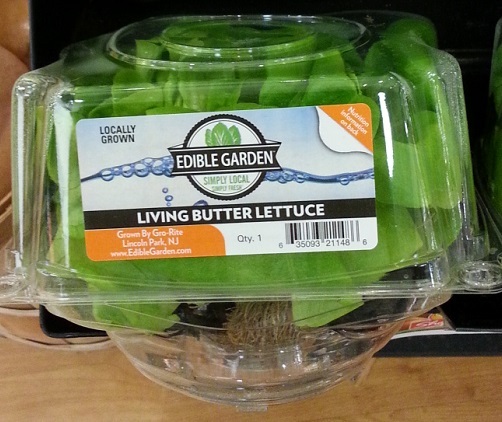 Or you could eat it with a spoon in a bowl, i guess. *This can be made entirely with all-purpose flour, but because of the lack of egg, vegan crusts tend to be a bit pale. The addition of white wheat flour gives it a nicer color and texture, imo. Mix the water and milk together and place in the freezer to chill. Place the cubed butter in the freezer, as well. In a food processor, mix the flours, sugar, and salt together. Add half of the butter (3 T) and process until the butter is well incorporated. The mixture will start looking a little clumpy. Add the milk mixture and blend well. Add the remaining butter, pulsing in short bursts just until the dough starts to form a ball, pulling away from the sides of the bowl a bit. Do not over-mix. There should still be small bits of butter visible. Flatten into a disc, place in a covered container, and refrigerate while preparing the filling. Peel and cube the sweet potatoes. Steam until tender (~20 minutes) making sure the water in the pot is no closer than 2 inches to the potatoes. Allow to cool slightly so that they're not hot. Preheat the oven to 350degF. In a food processor, blend the potatoes, sugar, cornstarch, molasses, sour cream, and creamer until smooth. Scrape down the sides and bottom of bowl. Add the remaining ingredients and blend well. Roll out the pie crust dough and trim to fit your pie dish. Pour the sweet potato mixture into the prepared crust. Loosely cover the edges with foil and bake for 30 minutes while making the streusel topping. Note: I always bake my pies on a baking sheet. First, because it's hard to maneuver a hot pie dish. 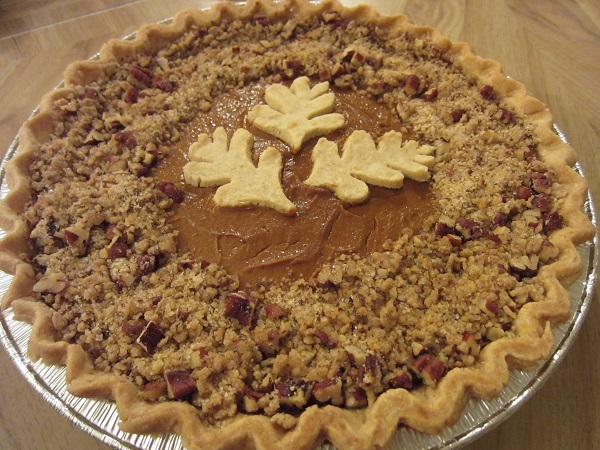 Second, because bits of crust might fall off or, with a fruit pie, there's always leakage. Having the baking sheet underneath the pie dish means i don't have to clean out burned gunk from the bottom of my oven. **I don't bother keeping brown sugar in the house. I just add molasses to regular sugar whenever i need brown sugar. I'm one of those annoying people who don't always measure, so i don't have precise directions. Just add a small dollop of molasses and mash it into your sugar with a spoon. Look at the color and if it's as dark as you want your brown sugar to be, call it done. In a small bowl, combine the flour, sugar, and spices. Cut the butter in, reserving the nuts. Reduce the oven temperature to 325degF. Remove the foil and sprinkle this mixture over the top of the pie after you've baked it for the initial 30 minutes. Bake for an additional 30 minutes. Alternatively, you could sprinkle the nuts over the pie for the last 15 minutes of baking and let them toast that way. Leave the pie in the cooling oven before removing to finish cooling on a wire rack. Refrigerate overnight before serving. 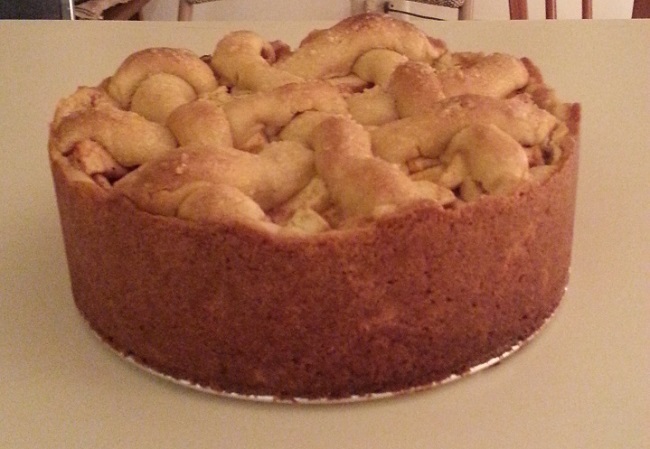 aka Winkel pie or Dutch apple pie. 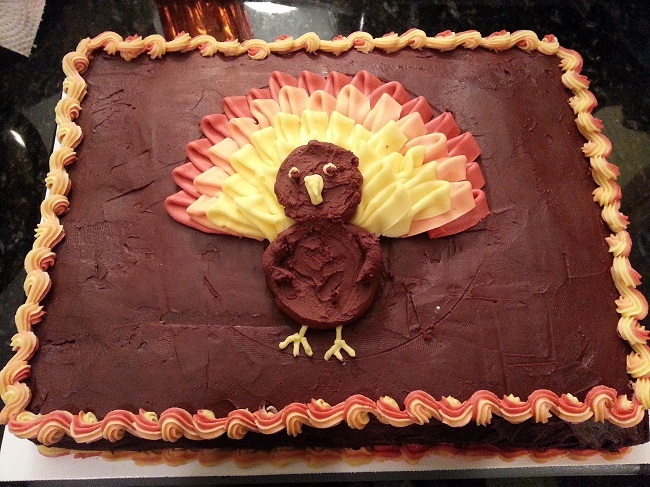 Made this for my family's Thanksgiving. I veganized and modified this recipe. It came out really pretty, so you get a picture. But you don't get a recipe until i've modded it more. Based on the descriptions i read online, i was expecting the crust to be more cakey. Instead, it was a super rich, super sweet shortbread. So i'm going to mod the recipe some more the next time i make it and see what happens. Until then, look at the pretty dessert. 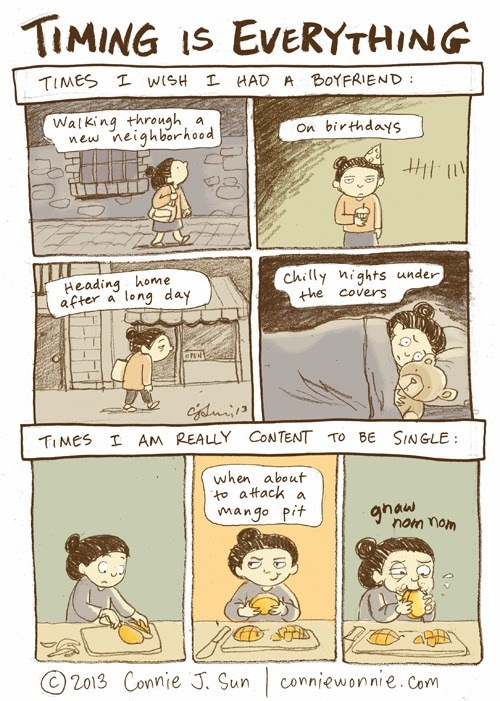 I'm posting this here so that i will forever be able to find this comic. Although, i prefer to stand over the sink in case of drippage. And it's a good idea to roll up your sleeves first. Yeah, But Can They Make Spider Silk? China's western Shaanxi Province is known for rugged windswept terrain and its coal and wool, but not necessarily its science. Yet at the Shaanxi Provincial Engineering and Technology Research Center for Shaanbei Cashmere Goats, scientists have just created a new kind of goat, with bigger muscles and longer hair than normal. The goats were made not by breeding but by directly manipulating animal DNA--a sign of how rapidly China has embraced a global gene-changing revolution. CRISPR uses enzymes to precisely locate and snip out segments of DNA, much like a word-processor finding and deleting a given phrase--a process known as "gene-editing." Although it is not the first tool scientists have used to tweak DNA, it is by far more precise and cheaper than past technologies. The apparent ease of this powerful method now raises both tantalizing possibilities and pressing ethical questions. Once the goat team began to deploy CRISPR, their progress was rapid. In September Qu and 25 other collaborating scientists in China published the details of their research in Nature's Scientific Reports. In early-stage goat embryos they had successfully deleted two genes that suppressed both hair and muscle growth. The result was 10 goat kids exhibiting both larger muscles and longer fur--designer livestock--that, so far, show no other abnormalities. "We believed gene-modified livestock will be commercialized after we demonstrate [that it] is safe," predicts Qu, who envisions this work as a simple way to boost the sale of goat meat and cashmere sweaters from Shaanxi. I don't think there's anything safe about extra strong, hairy goats. Have none of you heard of Dr. Moreau?? And his island?? His experimentation with animals didn't go so well, did it? Do you people learn nothing from literature??? I hate mad scientists. China's going to be overrun with sheep o'death now. IN A STATEMENT PUBLISHED in its online magazine, Dabiq, this February, the militant group the Islamic State warned that "Muslims in the West will soon find themselves between one of two choices." Weeks earlier, a massacre had occurred at the Paris offices of the satirical magazine Charlie Hebdo. The attack stunned French society, while bringing to the surface already latent tensions between French Muslims and their fellow citizens. While ISIS initially endorsed the killings on purely religious grounds, calling the murdered cartoonists blasphemers, in Dabiq the group offered another, more chilling rationale for its support. The attack had "further [brought] division to the world," the group said, boasting that it had polarized society and "eliminated the grayzone," representing coexistence between religious groups. As a result, it said, Muslims living in the West would soon no longer be welcome in their own societies. Treated with increasing suspicion, distrust and hostility by their fellow citizens as a result of the deadly shooting, Western Muslims would soon be forced to "either apostatize ... or they [migrate] to the Islamic State, and thereby escape persecution from the crusader governments and citizens," the group stated, while threatening of more attacks to come. It is tempting to view such violence as senseless and nihilistic. However, taking into account the Islamic State's history, it is clear that such a determination would be a mistake. By launching increasingly shocking attacks against Western targets, the Islamic State is pursuing a specific goal -- generating hostility between domestic Muslim populations and the broader societies that they live in. Despite its dire connotations, such a strategy is achievable for the group. In fact, some group members have successfully implemented it before, in Iraq, when the Islamic State's predecessor organization, al Qaeda in Iraq, purposely provoked a sectarian civil war in that country following the 2003 U.S. invasion. And it's working. Plenty of our governors are saying their states will refuse refugees (don't even look at Facebook comments). And France immediately upped their bombing campaign. Following the deliberately shocking attacks in Paris, some nativist politicians in both Europe and the United States have already responded with calls to collectively punish Muslims en masse through discriminatory migration policies, restrictions on religious freedoms, and blanket surveillance by law enforcement. Even though it's just perpetuating a vicious cycle. While politically popular among some, such measures, effectively holding Muslims collectively to blame for the atrocities in Paris, would be self-defeating. Islamic State is deeply unpopular among Muslims. Like their non-Muslim compatriots, French Muslims recoiled with disgust at the recent atrocities in Paris. Indeed, several of them were killed in the attacks. As such, it would be both perverse and counterproductive to lump them together with IS and blame them for the group's actions. Similarly, it would be absurd to treat refugees, many of whom are fleeing Islamic State's draconian rule in Iraq and Syria, as though they too are responsible for the crimes of the group. Doing so would grant Islamic State a propaganda coup, implicitly endorsing the group's narrative of Muslims and Westerners collectively at war with one another. Instead, in response to an attack intended to sow xenophobia, Western countries should reaffirm unity for their own Muslim populations and honor their best values by continuing to accept refugees without religious discrimination. Simultaneously, they should also recommit to the military effort against Islamic State's enclaves in Iraq and Syria, making clear that there is contradiction to embracing Muslims at home while fighting terrorists abroad. Such an approach would show resilience in the face of violence, while fatally undermining IS's Manichean narrative of "a world divided into two camps." I don't actually have enough faith in human beings to believe there's any chance xenophobia won't win out. Never rely on the "better self" to make an appearance. That way, you can be pleasantly surprised on the rare occasions it happens. A friend asked me to make a quarter sheet cake for his wife's birthday and instead of saying "no" like a right thinking person who's never made a sheet cake ever, the part of my brain that thought "Hey! A Challenge!" took over and "yes" came out of my mouth. 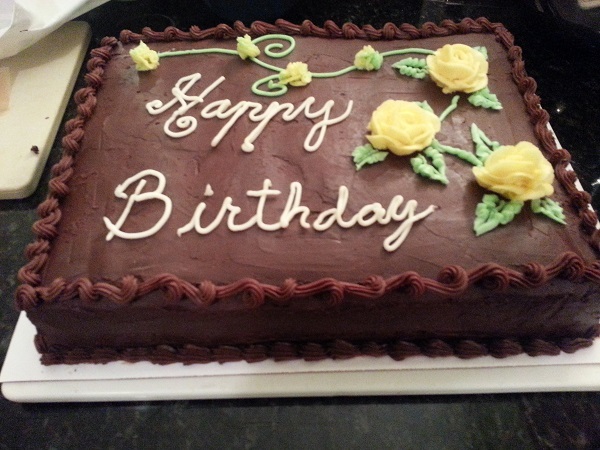 Happily, my first foray into the world of cake decorating came out pretty. And i finally used those decorating tips a friend gave me a decade ago. Woot. 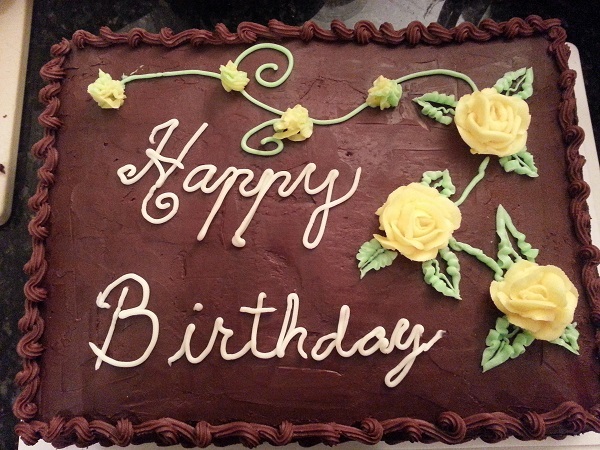 One might think the decorating tip that's designed to create flower shapes just by squeezing frosting out of it would have been foolproof. But no. That just produced those cute pom-pom things that don't look anything like what they're supposed to. Clearly, making freehand roses is the way to go. Special thanks to our D&D group for consuming my test cake. One thing i thought was interesting was the "A-Force Presents" trade, which will feature a single issue by each of several female-led Marvel titles each month. Everyone knows that i'm not a fan of anthology books because of the way i organize my collection, but it's interesting to see Marvel trying out that format. When i first went vegan, you could have tofu, you could have tempeh, or you could shut up. 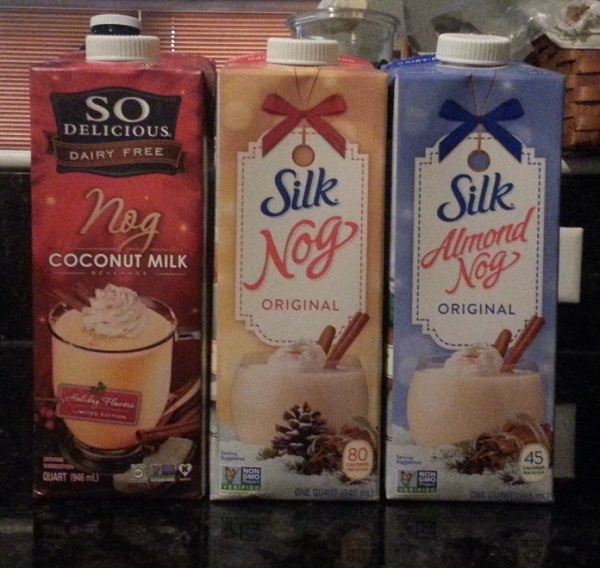 Nowadays you can buy three varieties of vegan egg nog. And of course we bought all three. I never even had eggnog before i went vegan. Ben Carson is getting a lot of flak for a 1998 speech where he put forth the theory that the Egyptian pyramids were used to store grain. It's pretty obvious that that's wrong; they were clearly used to store mummies. 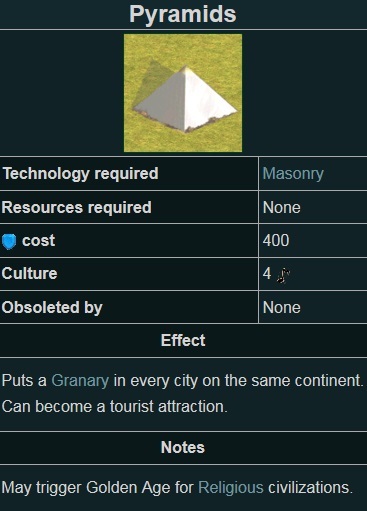 But what i haven't seen mentioned yet is that in the early versions of the great game Sid Meier's Civilization (versions 1-3, i believe), building the Pyramids put a granary in all of your cities. I was never sure why that was the case, but clearly there's something out there that dovetails with Carson's theory. Carson seems to be going by an interpretation of the story of Joseph in the Bible (he was sold into slavery in Egypt and later helped them avoid a famine). And given the way the pyramids work in Civ, i'd bet that it's not as unique a theory as it seems to be. Doesn't mean it's right, of course, but i'll take any excuse to blog about Civ. The bugs to be released were not genetically modified. But they were not exactly garden-variety mosquitoes, either. The male mosquitoes were raised in a laboratory where they were infected with Wolbachia, a natural bacterium that would effectively sterilize them. When the males are released into people's backyards and mate with wild females, the resulting eggs--for reasons not yet fully understood--simply will not hatch, leading to fewer mosquitoes. The problematic wild mosquitoes, also known as Asian tiger mosquitoes, were first introduced into the area as stowaways in shipments of bamboo from China and subsequently spread across the state. Unlike other California mosquitoes, they are potential carriers of dengue and chikungunya, two painful diseases that can be transmitted from human to human via mosquito bites. We have these Asian tiger mosquitoes (i'm having "Africanized bees" flashbacks) in Jersey. They show up at work, too, as in inside the building. They bite me through my damned pants, the little fuckers. So, i hope they start releasing these infected male mosquitoes in my neighborhood soon. Unless instead of eggs that don't hatch, they end up producing mutant mosquitoes. That would be bad. Don't do that. Winner, from a young kid to fnord (and fnord was NOT wearing a costume): "I watch you on TV every day." Runner up, in response to being handed a piece of candy: "I already GOT this one." Halloween being on a Saturday doesn't really mean that you need to buy more candy. You should always subtract 2 years from a bag of candy's expiration date. So if a bag of Peanut Chews says it expires in April 2016, the candy is probably already as hard as a rock. 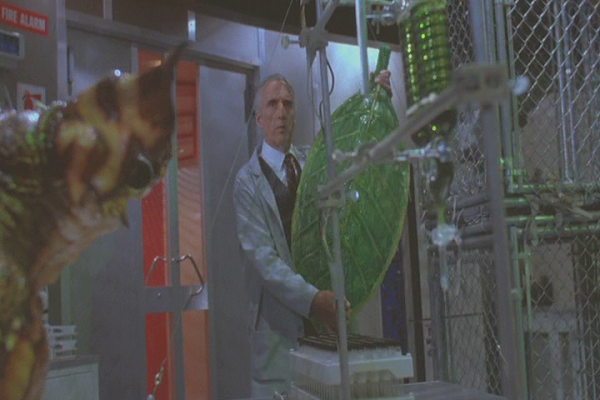 The mom in the original Gremlins movie is clearly ex-CIA, and she should get her own movie.